I was thinking about doing a silver fern for this theme, but after wandering around Auckland for two hours this morning and noticing the trees around us, I changed my mind! So, here we have Pohutukawa tree nail art! 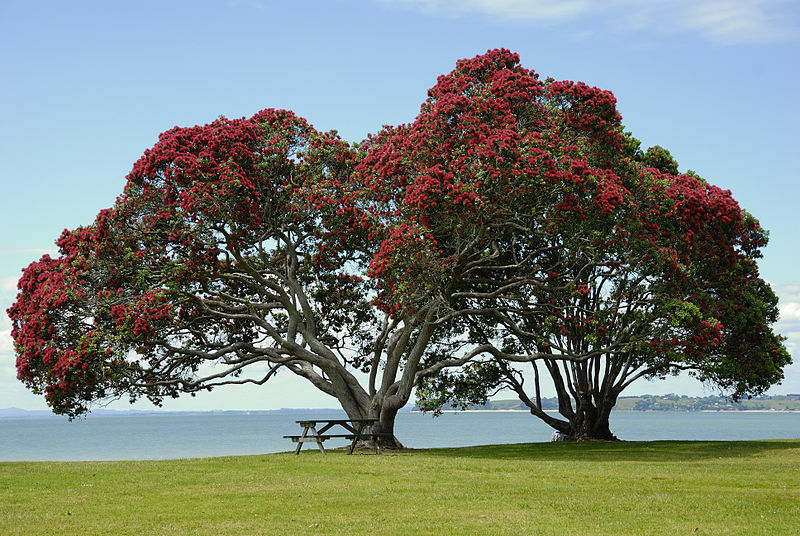 I don't know a lot about Pohutukawas to be honest, but I can recognise them and know that they're seen as New Zealand's Christmas tree. According to Wikipedia, "the Pōhutukawa is a coastal evergreen tree in the myrtle family, Myrtaceae, that produces a brilliant display of red flowers made up of a mass of stamens. 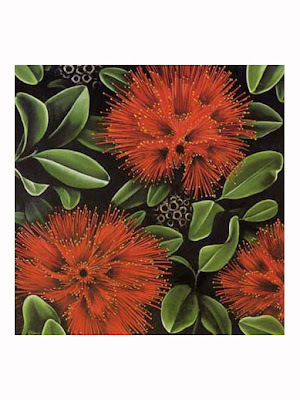 The Pōhutukawa is one of twelve Metrosideros species endemic to New Zealand." While googling these trees, I found this picture here, which I decided to base my design on. Jordana: Rich Green, White, Black. 1. Painted my nails black. 2. Painted on little green leaf shapes. 4. Painted red stripey lines in a circle as the flower. 5. Went over that with My Chihuahua Bites to get a bit of variety in colour and added some dots of Mad about Mango. 6. Went over that again with red, an added a few more dots, including some in black. Oops, this post is really photo heavy! This Jordana polish, Rich Green is one that I got today and really like! I was so stoked, I went shopping here in Auckland and found the best deals on heaps of nail polish products! Postie + had 30% health and beauty and Jordana polishes were only $3.50; where I live they're $5! I ended up with a pack of neon minis by Kleoncolour, two new LA Colors Art Deco polishes, some more make up wedges, four Jordanas and more cotton balls for about $28! This is amazing - your leaves are perfection...and so great to learn about this tree. It looks a little like a combo of a myrtle we have here on the West coast of the US with a cross of a type of red flowing eucalyptus that is not got the normal eucalyptus kind of leaves...maybe what I have been calling this red euc tree around here really is this myrtle - you are going to have me researching what we call a flowering euc tree here that lines the city side walks in our mini downtown (all 2 blocks of it! This is stunning! The colors and design all equal gorgeous! I love this! Such a flippin' pretty mani, and what a pretty plant! It's nice eh? I don't see it where I live so it's a treat for me to see it at the moment :) Thanks! This is gorgeous Jessie. I love Pohutukawas! ah! Cute we both did the same tree!!!! Good choice! and epic nails! Great minds think alike! Thanks, and yeah, it fits in really well at the moment! Thank you! NZ has some gorgeous plants/trees.